Unique purple amethyst gemstone engagement ring for women. Fabulous 14k solid gold engagement band. 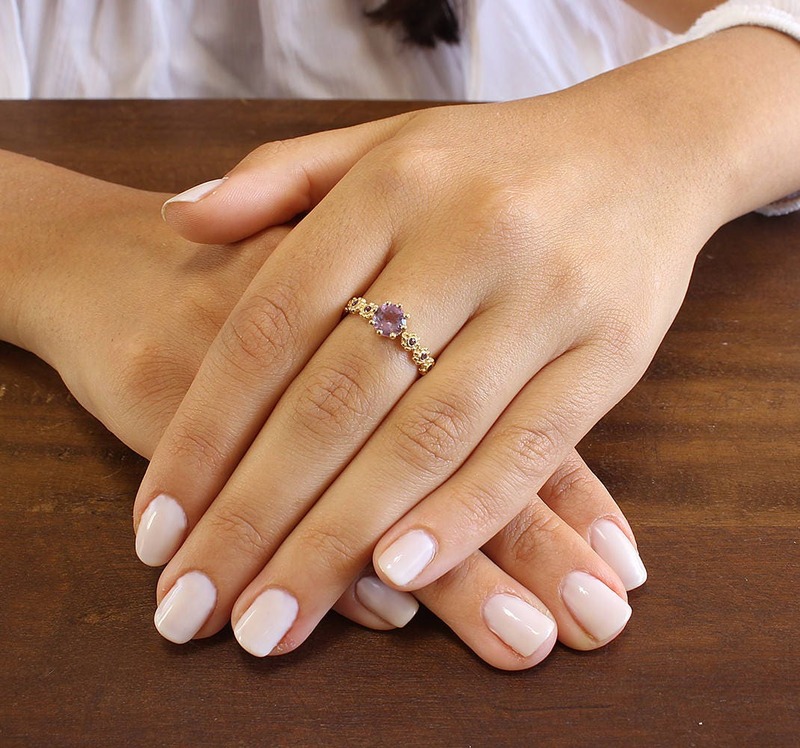 Gorgeous 14k solid yellow gold engagement ring for women with beautiful purple natural amethyst gemstones. My unique original design has a stunning natural amethyst stone in the center, and 5 smaller amethyst stones on each side of the center one. The smaller stones are each nestled in the center of a solid gold flower. Can be a fabulous engagement and promise ring for her. Fantastic special jewelry gift for your loved one, to cherish for years to come! Our classic timeless design will match anything in your closet - from casual daily wear to fancy evening outfits. Make that special moment a memorable one! * Amethyst center stone diameter - 6mm / 0.236"
* Amethyst smaller stones diameter - 1.5mm / 0.059"
♦ Material: 18k or 14k Solid Gold. ♦ Width of Ring: 1.45 mm / 0.057". ♦ Width of flowers: 3.5 mm / 0.138". ♦ Thickness of Ring: 1 mm / 0.039". ♦ Please choose your preferable size from the drop down menu during checkout.